Three favorite My Little Bible Series books in one big Bible book! Suitable for ages 2-5, this bundle is selling for only 99 cents today. 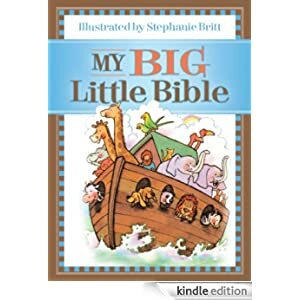 My Little Bible series has long been a favorite of young children, Bible stories, Promises, and Prayers simply told with bright friendly illustrations. My Little Bible is a collection of 42 Bible stories told in simple, understandable language that little ones can comprehend. My Little Bible Promises includes Bible verses of God’s love, care, guidance, forgiveness, and blessing for young readers to learn and treasure. My Little Prayers includes various prayers surrounding subjects such as meal times, bedtime, and time with God and others.